Tessa Pearce started the business 31 years ago and has built a reputation for reliability with her enthusiastic and helpful staff. When fulfilling your orders the emphasis is on making certain that customers are happy. The photographs below show our premises. Our team that are ready to help you with enquiries, orders and deliveries - if you're looking for something special then don't forget to enquire. The Dorset Restoration logo is taken from a rubbing of a swan design on an original cast iron fire grate circa 1780. 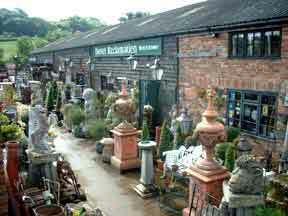 This photograph shows part of our premises in Bere Regis. Our yard and two storey showroom has thousands of square feet of space - all stocked with the highest quality reclaimed architectural materials and artifacts. Not to buy any item if there is the slightest suspicion that it is stolen. Not to knowingly buy any item removed from listed or protected historic buildings or scheduled monuments without legal consent. To record the registration numbers of vehicles belonging to persons unknown who offer items for sale, and to ask for proof of identity. Where possible to keep a record of the provenance of an item, including the date of manufacture, where it was removed from, and any previous owners and known makers. To the best of its ability and knowledge, to sell material free from toxic chemicals, excepting those natural to the material, traditional to its historical use, or resulting in atmospheric pollution. To allow their business details to be held on a list of businesses who subscribe to the Salvo Code. To display a copy of this certificate in a public position within each trading business premises.